The 'unlucky' stone balls are being removed from My Dinh National Stadium in this photo posted on Facebook. Management of the My Dinh National Stadium made sure to have several stone decorations removed from one of its stands in order to improve the venue’s feng shui way and preemptively eliminate any misfortune for the country's beloved football team. Though removing the stone decorations was widely criticized on social media, it seems to have worked. After all, the Golden Stars did manage to notch a 2-1 victory and advance with a 4-2 aggregate score to their first AFF Championship final in ten years. My Dinh National Stadium was first put into use in 2003 when Vietnam hosted that year's Southeast Asian (SEA) Games . The stadium is part of the namesake sporting complex and is the largest in Vietnam. Prior to the match, stand B of the 40,000-seat stadium had been decorated with 40 huge stone balls linked by a chain. On Wednesday, match organizers requested that stadium management remove the sculptures, according to Thanh Nien (Young People) newspaper. 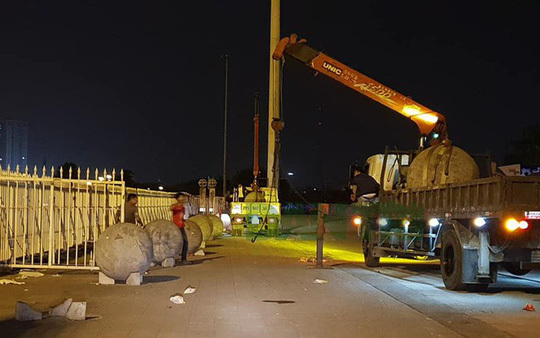 A representative of the My Dinh Sporting Complex confirmed to Thanh Nien on Thursday morning that they had been asked to "move the stone balls to somewhere else." "Maybe [the organizers] consulted with some feng shui masters," the official said. "Spiritually speaking, those balls don’t bode well for the Vietnamese [football] team." The representative added that the 'chained balls' do seem to have brought bad luck for Vietnam at home games in Hanoi. Vietnam played five AFF Championship semifinal games at My Dinh from 2004 to 2014, with three draws and two defeats. "Sometimes you have to be spiritual," the representative told Thanh Nien. "Maybe the chain that links the stone balls also casts a no-win curse on Vietnam." “Anything is worth doing if it helps the Vietnamese team in their important game,” the official added. Asked about the fate of the stone balls after the Vietnam-Philippines clash, the official said they will be "put back where they were." Vietnam will play the first-leg final match on Malaysian soil on December 11, before returning to Hanoi for the second-leg match on December 15. Football fans across Vietnam spent Thursday night celebrating their team’s first final berth at the AFF Championship in ten years.